Children are famous for playing a different role at home and at school. Adults are probably a little more complex, presenting different faces at different times, depending on how in or out of balance they are, or whether they are feeling secure or insecure. For example, my children know that after 11 pm their mother turns into a grumpy sleep deprived reptilian capable only of minimalist responses, such as: “Go away”, “I need to seep” or “Tomorrow, not today”. Of course, this is not the countenance that I represent to my clients, or to my children when they have exam, birthdays, or are genuinely in trouble. Each of us generally plays a different role, given different circumstances. 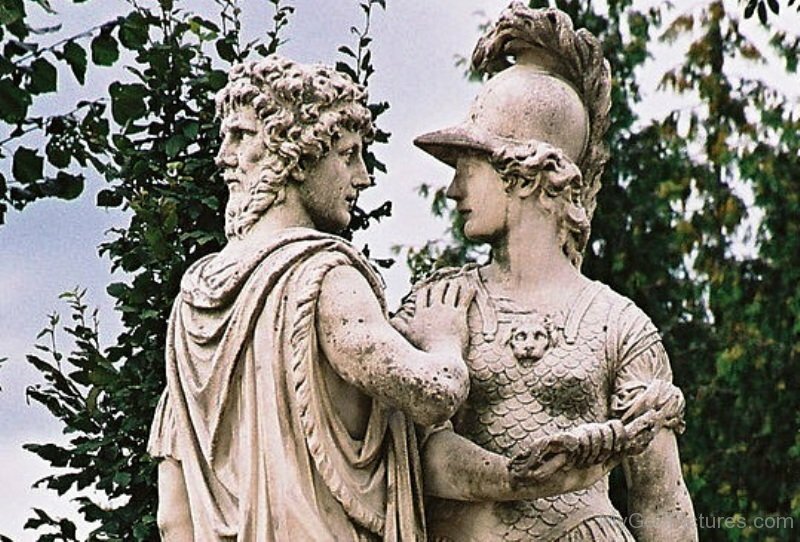 Looking for Janus, the 2 faced deity, I came across this representation where he is depicted with Bellona, the sister of Mars. As you can see he is presenting his persuasive, friendly side, and has his hand on her shoulder, while she looks like she is ready to whack someone, or really, anyone who stands in her way. Bellona, like Mars, is a deity of war, and embodies the raging tumult of battle. (Yep, I admit it, women can be raging furies too). My partner has thankfully worked out that if he can present his gentle and calm side like Janus when I am upset, full battle is averted successfully. However, when confronted by his stern and grim countenance, my Inner Teenage Rebel takes over, and our conflict escalates. Instead of being averted the conflict lasts days rather than minutes, a lot of fear and anger energy is unleashed, along with wounds and regrets. The reality is that my partner, my children and I have to come to terms and accept that the person I would like to be, is not the only personality that lives within me. If I had to draw a face for each personality, I would end up like one of those mixed up mythical beasts with many different heads and tails. 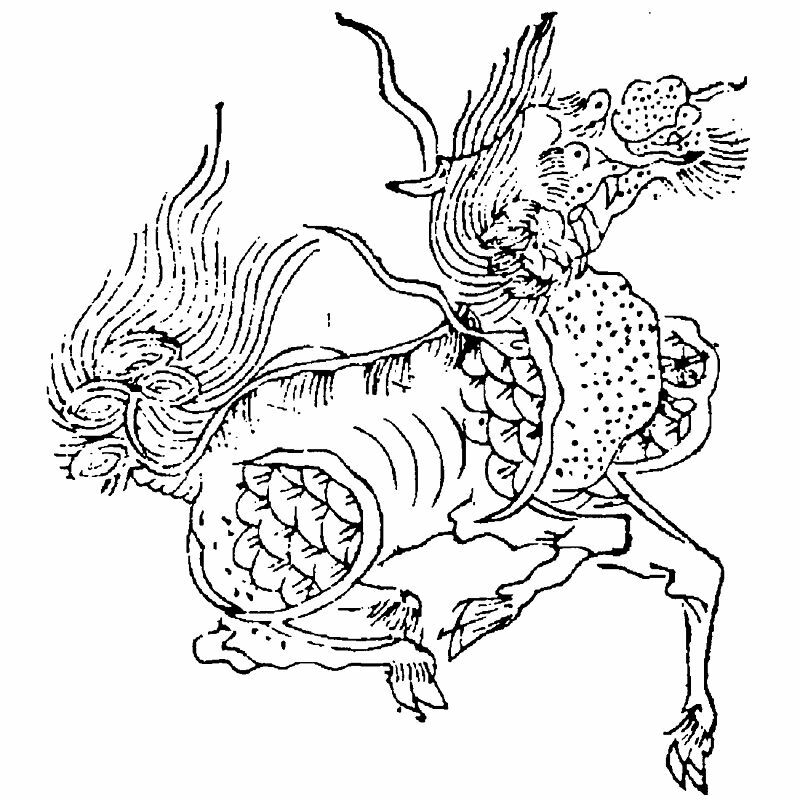 The Qilin – a creature with the head of a dragon, the antlers of a deer, the skin and scales of a fish, the hooves of an ox and tail of a lion. In fact, it is ok to be a mixed up bag of personalities rather than a careful edited selection of roles that you want to be. The Chinese philosopher Confucius viewed human beings as messy, multidimensional creatures, a jumble of conflicting emotions and capabilities living in a messy, ever-changing world. We are who we are by constantly reacting to one another. I would go even further and say it is the flipside of being human. You see, as humans we start off with a blank slate in our brain that adapts to our environment, unlike animals that arrive with a pre-determined set of behaviours. Neuroscience shows we come into this world with a brain that is impressionable and suited to adopting the dominant socially accepted behaviour patterns necessary for survival. The first 2 years we imitate everything indiscriminately. 2-3 year old male toddlers can be observed walking with exactly the same gait as their father, while the language patterning of pre-school age girls will sound word for word like the teacher, their mother or an older sibling. Once we have mastered the physical functions we develop the social brain; observing each situation with other children, siblings, parents, teachers, colleagues to evaluate which behaviour is most advantageous for fitting in with the herd, or achieve our objectives. We then emulate and adopt that behaviour. If it continues to work that behaviour will become automatic and a part of our personality. We soon forget it was just a role we were trying out. And so we progress through life, responding to changing circumstances and needs by developing personalities that fit. In my case I learnt that during times of escalating tension and stress, the one with fiercest bark got left in peace, and that equally in other cases the most compliant, people pleaser got the most praise,or goodwill. As an adult, I can make fun of the paradox of the bag of personalities within me; however I do have to take responsibility and recognise if that aspect of self is causing harm to others and to myself, steps to limit or transform that aspect of self are required. In short I have to tackle the monsters inside of me, not give them free reign, or abdicate responsibility for my re-actions. Switch roles. If I find myself in a rut pattern, change the roles occasionally to allow new modes of interaction, and a new perspective. My mother taught me this. She simply went on strike on certain days, put the children in charge and pretended to be a kid. Or she would declare martial law and pretend to be a commander. If I am in a situation where I continually get triggered in my old role, I simply act as if I am someone else. This enables a different perspective, and as a result the dynamics change. To repeat the same pattern each time and expect different results is madness after all. If you find yourself triggered – apply the brakes by removing yourself from the threatening situation or checking assumptions. Our monster selves are normally triggered when the subconscious flags that a present situation is beginning to match past situations where we were hurt physically or emotionally . Once danger or threat has been identified the brain automatically switches from the rational brain into the amygdala, also called the reptilian brain. Anyone who is scared of snakes and has walked past a stick on the ground in the dark knows how irrational and jumpy we become when the amygdala is triggered. The trick is then to override the amygdala by taking time out to (1) calm down, slow breathing helps, and (2) double check if the stick is a stick or a snake. As our brains work on predictive bias often what we presume to be the case is in fact just a false alarm. Some call this False Evidence Appearing as Real. Train the monster – remember the automatic behaviour is something we copied, embedded and apply in any given threat situation. However it may not be appropriate as an adult with your loved ones. You can program in exceptions to the automatic behaviour simply by intent and will power. I was most impressed with a friend of mine who said that she and her husband have an agreement to always speak nicely to each other, no matter what. Its a bit like training your monster to only bare its teeth at strangers – not the family in the house. Face the underlying fear or anxiety. If there is a situation that is triggering the monster within, you can identify the underlying fear or threat, and then release it, or make it extinct by placing it into the original context. The monster is simply there to protect me. If I deal with the fear or anxiety then the monster will not be activated. In the words of one of my clients “be bigger than the thing that you are facing”. Or to use the dog analogy again, a German shepherd dog that is relaxed and has plenty of opportunity to do protector thing, will be totally unimpressed by a yapping little fluffball dog. Interestingly, the Tibetans refer to the entrances of heaven and hell being located not in some location at the other end of earth, but right within our bellies. The potential for war and peace, bliss or diss, reside within. We always have a choice – moment by moment – as to what we bring forth into this world. Hypnotherapy is a good way of working with the personalities or behaviour that are sabotaging yourself or your relationships. To discuss call Julia on 0412 362338 for a free phone consultation.